The Boston Globe came for a meal at the Acton location. Their story is here. The ocean is 30 miles away. The closest water to Twin Seafood in West Acton is Lake Nagog. But take a seat at one of the picnic tables under towering pines, beside the seafood market, and it’s easy to imagine you’re in a fish shack somewhere along the coast. This is seafood-in-the-rough circa 1950. An “I Love Lucy” rerun is on TV; half a dozen tables are inside beside a fish case, more tables and giant rocking chairs are on a deck beside the shop. Order at the counter and someone brings you food. The pines might seep resin that falls on your table. Don’t think the tables aren’t clean. That’s sap. Embrace the great outdoors while you eat really fresh fish. The lobster roll at Twin Seafood. 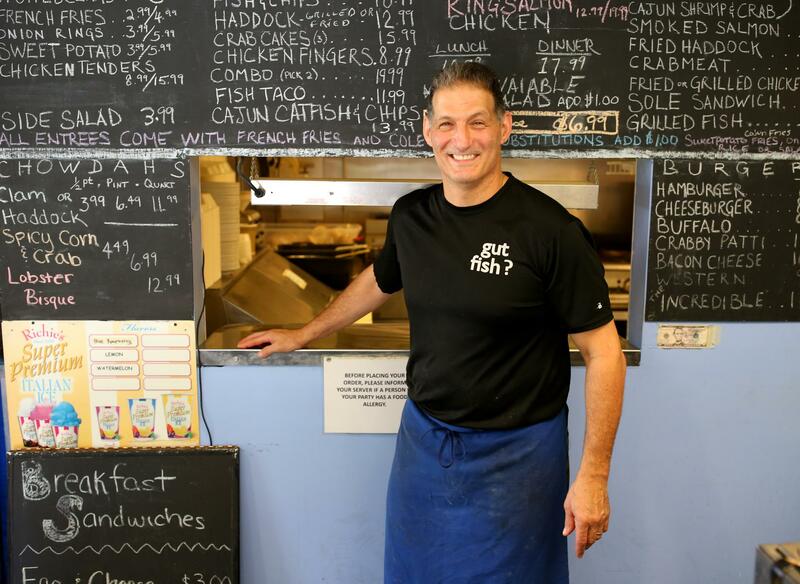 Owners and twins John and Joseph Loblundo, 53, raised in Somerville, have operated Twin Seafood, with a few dozen seats, in West Concord for 25 years. They ran a similar place in Belmont for six years, but the rent was too high to maintain. They found the West Acton location, a former art store with a deck beside it, five years ago, after driving by it every day. “I’d picture what the fish store looked like,” says John Loblundo. The twins have a BYO license so you can carry drinks in. There’s music on the weekends. They take seafood seriously, using vendors who bring in fish from our coastline, Rhode Island, Maine, and the Eastern Atlantic. 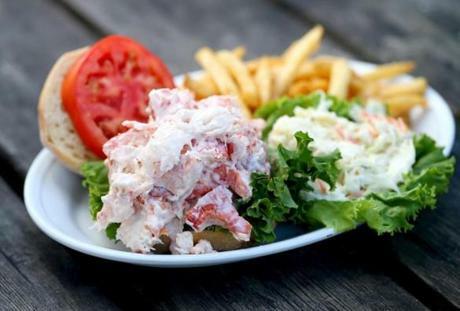 A lobster roll ($19.99) is heaped with chunks of shellfish, with very little mayo or other seasonings. Instead of the classic top-loading hot-dog bun New Englanders are used to, the salad is in an Italian Bianco roll, soft inside and floury outside. Only the crust is heated on the grill so the center crumb can absorb the salad juices. It’s beautiful. Fried clams ($17.99 to $26.99) are crispy and juicy with luscious plump bellies. Golden fried calamari ($13.99 to $19.99) have crisp, spidery tentacles, but the bodies, cut into rings, are too chewy. Both come as an appetizer or platter with fries and homemade tartar sauce, piquant with dill pickles. About those fries. Do you prefer yours with a coating that keeps them crisp, or do you want plain, which means they’ll go soggy more quickly but nothing is on them? I want plain so they don’t taste like a fast-food place’s. Here both regular potatoes and sweet potatoes are coated. There’s a lot of takeout being picked up, and when those folks get home, their fries will still be crisp. Fish and chips ($10.99) offers three big pieces of Eastern Atlantic cod that is surprisingly juicy but firm. The cooks will fry, grill, or broil any fish. Platters ($8.99-$19.99) come with slaw and fries, but for $1 you can substitute sweet potato fries, onion rings, rice, or a salad. A thick piece of grilled swordfish is so fresh and perfectly cooked that I have to wonder why so many places pan-fry woeful, thin pieces of sword. The slaw is a cross between American and German, with a lightly sweetened, vinegar-seasoned mayo dressing. A thick piece of tuna on a salad comes rare in the center, as ordered. The salad dressing could be Wish-Bone, which isn’t up to the gorgeous fish. Creamy clam chowder ($3.99-$11.99) isn’t too thick and has lovely clam taste. A rosy, intensely flavored lobster bisque ($4.99-$12.99), seasoned with sherry, has tiny nibbles of lobster meat. It’s the classic version, made especially for the shop, and I can picture it in a white-tablecloth restaurant on a soup plate with a pretty garnish of diced lobster tail and creme fraiche, served with a silver spoon. One day I bought a container of lobster salad, and at home stirred in more mayo, a tiny bit of finely chopped celery, and a generous squeeze of lemon juice. I tucked it into rolls for lobster sliders. Heaven. Counter service can be brusque. And the pine sap can fall on your head (John Loblundo isn’t crazy about this either). Then there’s the seafood, which is just so good and so nicely prepared. You’re outside in the fresh air. You’ll actually wonder why you can’t hear the roar of the ocean. 541 Massachusetts Ave., West Acton, 978-635-0010, www.twinsseafood.com. All major credit cards. Wheelchair accessible. Prices Appetizers and chowders $3.99-$27.99. Sandwiches and platters $7.99-$19.99. Hours Mon-Thu 9 a.m.-8 p.m., Fri-Sat 9 a.m.-9 p.m., Sun 11 a.m.-7 p.m.
What to order Lobster roll, clam chowder, lobster bisque, fried clams, fried calamari, grilled swordfish, fish and chips. John Loblundo runs Twin Seafood with his twin brother, Joseph.